This entire table was inspired by these recently thrifted large square Italian plates! They only had two so, I snatched those two and searched like crazy throughout the store for more. But, there were no others. I started the table with these wonderful large square woven placemats. I bought them last week at the Christmas Tree Shops. They were .98 cents each. They ground the table with a very natural feel. What a delightful tablescape. I'm in love with your cheese plates. So fun!! Beautiful setting, but those berries steal the show. They look so yummy! Hi lovely lady. You did a BEAUTIFUL tablescape sweet lady on your patio. I love your dishes also the cheese plates so sweet. I hope you have a wonderful week. Tanti baci from this Italian Girl!! What a great table scape and it all looks so yummy. I am now drooling all over my keyboard. This table looks so natural and inviting-like people would sit down and eat and enjoy a meal for several hours. How pretty. I love it! Diane, I really love the color scheme of your beautiful table!! The warm browns are my favorite colors! Yum! I'll be right over! pour me a glass! Diann, Your Tuscan table is beautiful and what a great deal on those wonderful place mats. I love the dishes and the little tureen with the berries. Thank you for joining Summer Entertaining. What a great table! It was so origional and interesting. Great photos of detail. This is wonderful. The bowl of raspberries and blueberries is pure art! That is a lovely tablescape. You have a knack for bringing things together to make a beautiful setting. Add the cheese, fruit and crackers and it's complete. Girlfriend, your Old World Tuscany table is simply delicious!!! Ohhh...I love, love, LOVE your new Tuscany plates! Not only do they make a beautiful table setting but I could see those on a display easel too...they really are gorgeous pictures! Well dear friend, your cheese plates are perfect with the old world Tuscany dinner plates! 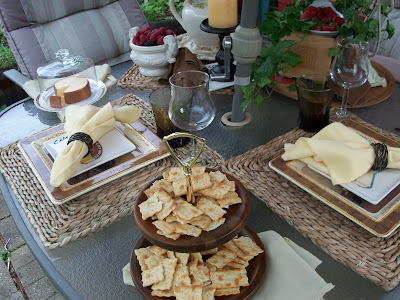 And...I love how you anchored them with the old looking rattan mats! Just beautiful! Beautiful table centerpiece too...in fact, it really looks more like a vignette and I love that!!! Great treasure finds, dear lady! Thank you for sharing them with us...and your fabulous Old World table too! PS...ooh, that lovely round of cheese and bowl of raspberries and blackberries has made me hungry! Hehe! Haven't used them yet though! Pretty table, and very appetizing food. This tablescape looks very inviting. I love the wine and cheese, add in that fresh fruit and I'm there! When would like us to come? LOL! I love the pitcher w/florals on the plate too, it's very pretty!